We were contacted by Janet Drinnan, who lives in Hawkes Bay, New Zealand. She is the great granddaughter of Caroline Sawle neé Martin, 1836 – 1903 (Chapter 10 of The Complete History). Janet kindly provided a photograph of Caroline which she believes was taken in Christchurch after the Sawles moved to New Zealand, probably in about 1886 when Caroline turned fifty. Janet has been a long-time collector of Martin family history and provided further details about the Sawles in New Zealand. In particular her information emphasised that initially after their move to the South Island, the family was quite successful. For instance, Freeholder Returns for 1882  show that James Wright Sawle, farmer of Greendale, held 1545 acres valued at £7557. His son James held a further 435 acres valued at £2122. It was later that his agricultural endeavours came unstuck (p. 180 in The Complete History), although the bankruptcy hearing in 1897 concluded this was not due to mismanagement and Mrs Sawle (Caroline) was allowed to keep their furniture. Research into the family of Thomas and Elizabeth Martin of Stithians threw up several mysteries, one of which concerned the fate of their youngest child, William. Several possible marriages and deaths were considered in the course of research, but rejected for lack of conclusive evidence. Correspondence from Janet Drinnan has prompted the following revisit. As related in our book, The Complete History of Arthur and Rose, William was baptised on February 10 1833 in Stithians and thus was most likely born towards the end of 1832 or early in January 1833. This is consistent with the age (8) recorded for him in the 1841 census. Given that all his brothers attended the Stithians Parish School where their brother John taught, William was likely educated there too. He was fifteen when his father died in September 1848, and sixteen when he, his mother, sisters Elizabeth and Caroline and brother Henry boarded the Sarah to sail for New South Wales. The ship’s list of immigrants, apparently made on or after arrival in Sydney on 10 December 1849, gives William’s age as seventeen and his occupation as farm labourer. The age given is consistent with a birth date in 1832. He travelled to South Australia with his family on the Wild Irish Girl, arriving on May 21 1850. In the Complete History it was suggested that no further information could be definitively linked with this William Martin. As the book describes in Chapters 10 and 11, the Martin siblings seem to have remained relatively close and maintained contact after arrival in South Australia although separated geographically. There is no mention of William Martin in association with any of his siblings even though in the 1850s and later, the others at times lived in close proximity, visited each other , sent gold from Victoria and were mentioned in letters. Of course a young man of eighteen or nineteen would not perhaps have left any trace in official documents or newspapers. He may well have lived with family members after arrival and gone to the goldfields with his brothers, or he may have branched off on his own. It has been suggested (Janet Drinnan, Goodfellow family tree on Ancestry) that the William Martin of our family story is the one who married Margaret Hayes by license on March 18 1855 at Mount Barker in a Roman Catholic ceremony. Registration records for this marriage do not identify the fathers of either groom or bride. The priest was recorded as Michael O’Brien and the witnesses, Patrick Ryan and Margaret Shelly; William was twenty and Margaret, eighteen. There are two problems in identifying this William as the one of our history. If the groom were twenty, he would have been born between March 1834 and March 1835 whereas our William was born before February 10 1833, the date of his baptism. Our William had some education: he would most likely have known his birth date, and it seems unlikely that a legal adult, as he was in 1855, would have presented himself to marry as a minor. Secondly, the Martin family members in this history were either Church of England or Wesleyan, with William recorded as Wesleyan in the Sarah’s list of immigrants. It seems very unlikely that he would have married a Roman Catholic. A second marriage suggested for the William of our story is that recorded between William Martin age fifty-five, widower, father Thomas, and Hannah Bradbury age 55 at St Philip Church Belvidere (in the lower north, about 20 km from Saddleworth) on June 24 1886. In this case the groom would have been born between June 1830 and June 1831, not entirely inconsistent with a February 1833 baptism, but unlikely, although the father’s name is a possible link. However a genealogy for an unrelated William Marten found in Ancestry claims this marriage. There is no unambiguous record of a death for the William of this story in South Australia. A Courtney family tree on Ancestry claims that he was the William Martin, labourer, age 57, who died in Burra Hospital on December 24 1891. No relative was recorded, and the informant was E. A. Pearce, carpenter. This is possible but could not be the same William Martin as in the previous paragraph because of the age inconsistency. Age 57 at death would make this William born between 24 December 1833 and December 1834, close but not early enough to have been baptised in February 1833. William Martin (no middle name) was a common name among immigrants to South Australia. There are five in the 1842 – 1916 index of marriage registrations who married in the 1850s with no father recorded. The Index to South Australian Passenger Lists 1854 – 1886 shows that thirteen adult William Martins emigrated between 1846 and the 1855 date of the Margaret Hayes marriage. A further twenty-two emigrated between 1855 and 1886, the date of the Hannah Bradbury marriage. The Hodge indexes in the South Australian State Library show five William Martins (without other family) departing for Melbourne or Geelong between 1851 and 1854, as well as two returning. Farmer William Martin of Staplevale Farm Unley. He was in court regarding theft of his property, (Adelaide Times, 1 October 1850 and 18 October 1851), non-payment of wages to his workers, (South Australian Register, 31 December 1851), then declared insolvent and imprisoned in May 1852 (Adelaide Observer, 29 May 1852). William Martin, licensee of the Terminus Hotel North Terrace (Adelaide Times, 12 June 1855). William Martin who gave evidence in a case in June 1854 concerning the illegal removal of potatoes at a property near Mt Barker. (Adelaide Times, 10 June 1854). This could well have been the William Martin who married Margaret Hayes at Mount Barker. Numerous William Martins included in ‘Unclaimed Letters’ lists during the period. It is clear that there were multiple William Martins in the colony from 1850. Some of these above may be the same person and some obviously are not. None can be unequivocally identified as the William Martin of our history. There are deaths for William Martins in Tasmania and New Zealand where the ages fit to the period 1832 – 1833. But again there is no clarity. Our William Martin’s fate remains a mystery. She has followed the story of the Cornish cousins – the Martins and their descendants who stayed in Cornwall - for more generations than in The Complete History. From this, it is clear that many of Nicholas Pearce Martin’s descendants continued to live in Cornwall, some to the present day. Suzanne’s public records do not show details for the descendants of Nicholas Pearce Martin who are still living so some guesswork is necessary for the most recent generations. In what ways were the lives of Martins in Cornwall different from those who emigrated? It seems difficult to draw any general conclusions. As shown on pp.34-35 and in Suzanne’s records, Nicholas Pearce Martin and his wife Caroline (nee Peters) lived out their lives in Stithians parish with Nicholas working as a miner, initially as a copper miner and later (around 1865 – 1880s) as a tin miner. Of their children, the males were all miners. Both Thomas and John went to southern Africa as goldminers but both died young. Nicholas was a tin miner living with his parents in Crellow in Stithians parish in 1881 according to the census but later joined the gold rush to the Klondike in the 1890s. Suzanne lists an additional son, Henry, who apparently became a mine captain. Of the three daughters, Jennifer (Jane) married a miner/stoneworker. So a majority of the Martin branch who remained in Cornwall continued, for some time, to depend on mining for a living. This was true of some of Nicholas’s emigrant siblings and a few of the next generation although a majority found different careers in the Antipodes (Chapters 10, 11, 20). In subsequent generations of the “Cornish cousins” there were farmers and other occupations but apparently no more miners. Three of the children of Nicholas Pearce and Caroline Martin (John, Jennifer and Eliza, chart on p. 35 of The Complete History) produced offspring. 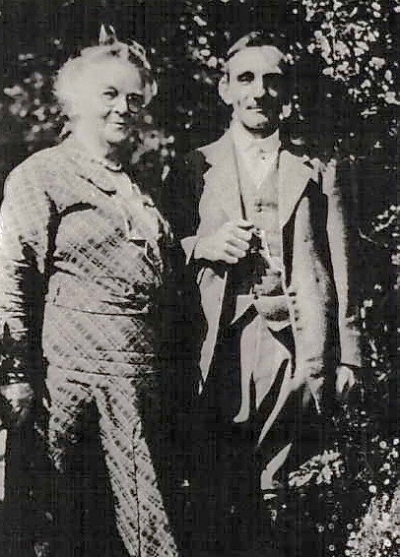 The youngest son, John Martin (1870-1902) with Ellen (nee Spargo) had a son, Michael Martin (1900-1979) who in turn married and had four children in Cornwall. Two of these are male and may be carrying on the Martin name. Jennifer (Jane) (1856-1927) married John H Collins in Stithians in 1880 and they had four children, three of whom had offspring. They have descendants in Michigan and other parts of the USA and in Cornwall and elsewhere in the UK, with surnames including Collins and Endean. Finally, daughter Eliza Martin (1865-1953) married John Francis (Jack) Jolly in Stithians in 1892 and they had five children, of whom two, Wearne Jolly (1893-1951) and his sister, Elsie, had children. He was a farmer at Probus, near Truro and later, further east at St Cleer near Liskeard, Cornwall. He married Elizabeth Catherine Collins in Helston in 1921 and their three daughters, Lorna, Margaret and Rosemary Jolly all married in Cornwall and had children and (probably) grandchildren there or elsewhere in the UK. An exception is Lorna’s daughter, Suzanne Taylor (nee Phillips) who has lived in Australia for many years. It seems clear that the Australian and New Zealand Martins described in The Complete History do indeed have some Cornish cousins (with possible surnames including Martin, Phillips and Endean) as well as some elsewhere in the UK and in USA.